Have you ever demanded that a child say they’re sorry immediately after they’ve done or said something aggressive to you or someone else? But did you know that when you do this, that in a sense you’re teaching the child to lie. That’s because in those moments surrounding aggression, the child is not able to access the part of the brain where empathy lies. In times of conflict and anger, the child is actually in “fight or flight” mode and is operating from the lower more reactive part of their brain. We’ve all been there – in fight or flight mode. Those are those times that we say things we regret later or that we can’t believe that we said! Dr. Dan Siegel, a prominent neuroscientist, provides a helpful simplification of basic brain structure. He refers to the brain as having an upper and lower brain. The lower brain is the more primitive part of the brain and houses the brain stem and the mid brain. While there are many functions of the lower brain, the part that is relevant to this discussion is that the fight or flight response is housed in the lower brain. Then if we look at the upper brain or cortex – it is the higher thinking part of the brain and is where the prefrontal cortex lies – at the front of the brain just behind your eyes. It’s relevant to note that the ability to feel empathy lies in the pre-frontal cortex (along with many other functions). What happens during moments of stress, anger and other negative emotions is that the prefrontal cortex disengages with the lower part of the brain and we go into that fight, flight or freeze response. So if we relate this back to the child who is in a state of aggression, he or she is unlikely to feel empathy, because the pre-frontal cortex is disengaged. So, at best by forcing a child to say sorry at this time will evoke an insincere response. That’s when we hear those “SORRREE”s with an accompanying dirty look and so on! Children do need to learn the importance of expressing their regrets and making amends for their actions. But first, adults will likely need to guide the child through a calming process so the child can once again access some sense of empathy and regret. Then at this point, the child will likely be ready to be guided towards a genuine expression of regret. 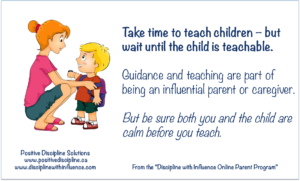 Below is one of the parent action cards from my Discipline with Influence Online Parent Program. The pre-ceding information should put the card into context. The time when the child is most teachable is when they are in a calm and positive state of mind. Learn other information about the brain that relates to effective discipline and communication in the Discipline with Influence Online Parent Program.